Over 13 million healthcare personnel including physicians, assistants and nurses are employed in homes, hospitals and emergency medical services in the United States of America. Personal protective gear can stand between them and disease; say Sumit Mandal and Guowen Song. Healthcare personnel deliver care directly or indirectly to patients infected with pandemic diseases like SARS (Severe Acute Respiratory Syndrome), AIDS (Acquired Immune Deficiency Syndrome), avian influenza (bird flu), H1N1 (swine flu), and multidrug-resistant tuberculosis. They also prevent further spread of these infectious diseases. It is necessary for healthcare personnel to wear Personal Protective Equipment (PPE) to limit morbidity and mortality of patients in their care, as well as themselves, their family members, and other members of the community to prevent a pandemic's larger societal progression. In the last few decades, the transmission mechanisms of pandemic infectious pathogens from a patient to healthcare personnel have been thoroughly investigated to develop PPE. Through these investigations, it has been found that infectious pathogens can be transferred to healthcare personnel through their respiratory organs and dermis via air and liquids (water, blood etc. ), and through mucus membranes (eyes etc). Thus, respiratory, dermal and mucus membrane protection are essential for healthcare personnel. Consequently, different types of PPE have been developed and made commercially. Commonly used PPE include medical masks, respirators, gloves, gowns and eye protectors. Some other types of PPE, such as face shields, are also occasionally used by healthcare personnel. Among these, respiratory (medical masks, respirators etc.) and dermal (gloves, gowns etc.) protective equipment are primarily textile-based and used regularly by healthcare personnel. In the following sections, respiratory and dermal protective equipment for healthcare personnel are critically discussed, and further research needs in the field of respiratory and dermal protective equipment are highlighted to help textile or material engineers to develop high-performance respiratory and dermal protective equipment for better occupational health and safety of healthcare personnel. In a medical institution, healthcare personnel need to wear different types of respiratory protective equipment including surgical masks, dental masks and respirators. Medical masks are readily available to healthcare personnel and cheaper in cost than respirators. Therefore, the use of medical masks by on-duty healthcare personnel is quite common. However, medical masks are not designed to be used to protect healthcare personnel from pandemic infectious diseases. They are mainly designed to protect patients from coughing or exhaled secretions of healthcare personnel. Thus, respirators are preferable for use as respiratory protective equipment, especially in a healthcare environment that may contain pandemic and infectious pathogens. In the early 20th century, medical masks were mainly reusable and made from multi-layered cotton gauze. Due to this multi-layered structure, the protective efficiency of these masks was high. However, these heavyweight masks affected breathability and comfort level of wearers who were mostly healthcare personnel. By the mid-20th century, lightweight disposable masks mainly made from a fine glass fibre nonwoven mat were introduced into the market as a reliable method of deterring airborne pathogenic microorganisms (e.g., viruses, bacteria and fungi). By the 1990s, different types of fibres (e.g., polypropylene and cellulose) were used to produce medical masks. The protective efficiency of masks made from different fibre materials vary. From highest level of protective efficiency to lowest, they are polypropylene, polyester-rayon, glass and cellulose. Currently, glass fibre is rarely used as it causes irritation on the wearer's skin. Polypropylene is the most frequently used fibre because it is both highly hydrophobic in nature and has a capacity for wicking, ensuring a dry and comfortable microclimate between the mask and face. Contemporary medical masks are usually composed of three nonwoven fabric layers-a cover web, a filter layer and a shell fabric. The innermost cover web is a spun-bonded nonwoven mat and lies next to the wearer's skin. The filter layer between the cover web and shell fabric is a melt-blown nonwoven mat that primarily deters hazardous aerosol particles, microorganisms and bodily fluids. The shell fabric is the outermost layer exposed to the ambient environment. This fabric is made from a spun-bonded nonwoven mat and supports the filter layer. Although recently developed medical masks can provide effective protection from comparatively larger airborne microorganisms or hazardous particles released from coughing and sneezing, the filter layer of these masks does not provide the same level of protection from inhaling submicron microorganisms or particles. Additionally, these medical masks were not designed to eliminate air leakage around the edges. As a result, these masks cannot fully stop spread of infection among healthcare personnel if they are exposed to patients of pandemic infectious diseases like SARS, influenza and AIDS. Considering the shortcomings of existing medical masks, in the late 20th century, air-purifying particulate respirators were developed for healthcare personnel. These respirators use protective textile fabric that is efficient in filtering any microorganism and designed to eliminate air leakage around the edges. While wearing these respirators, it is always recommended to use nose clips that can be adjusted to conform to the contour of a wearer's face. This can help to minimise leakage of microorganisms or hazardous particles between the mask and face. Conventionally, these respirators are mainly composed of four or five nonwoven fabric layers. In this case, two or three layers of nonwoven filters are sandwiched between a polypropylene nonwoven cover web and shell fabric. 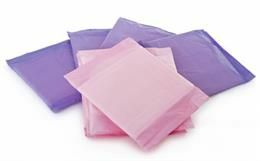 These filter layers are made of closely packed ultrafine polypropylene fibre-based melt-blown nonwoven fabric. As an additional upgrade, these filter layers are sometimes made from combining polypropylene and electret fibres that carry an electric charge. These electret fibres can capture hazardous particles and microorganisms via electrostatic attractions. This result in a higher level of protective efficiency for electret fibre filter layers compared to standard polypropylene filter layers. In fact, by adding electret fibres, filter layers become less densely packed without compromising on protective efficiency. This less dense structure can provide more breathability and comfort to wearers. However, it is important to note that the efficiency of electret fibres may degrade over time when exposed to aerosols, making the respirator less efficient. At present, respirators are standardised and classified by National Institute for Occupational Safety and Health (NIOSH) according to their filtering efficiency and protection capacity against oil aerosols. Based on filtering efficiency, filter classifications are labelled as 95, 99, and 100, which can deter 95 per cent, 99 per cent, and 99.97 per cent (essentially 100 per cent) respectively of exposed aerosols. Generally, these three filter efficiency levels are tested using the most penetrating particle size, i.e., about 0.1-0.3µm aerodynamic diameter. Considering the capacity of protection against oil aerosols, the respirators can be classified into N, R, and P types. Respirators are rated N if they are not resistant to oil, R if somewhat resistant to oil, and P if strongly resistant to oil. If a respirator is given an alphanumerical code of P100, this indicates that it can filter 99.97 per cent of airborne particles and is strongly resistant to oil. It is notable that healthcare personnel commonly use N95 respirators because they are disposable (so do not require any cleaning and maintenance), inexpensive, and easy to use. Based on the above, while different types of respirators with different levels of efficiency are commercially available, this does not eliminate the risk of healthcare personnel exposure to airborne microorganisms. This is because the existing respirators may not be ideal to sufficiently protect from airborne microorganisms, i.e., emerging new pandemic infectious diseases (such as Ebola) worldwide. Additionally, a respirator should properly be fitted to wearers, both to prevent inhaling microorganisms and for comfort. Furthermore, many pathogenic microorganisms that become trapped within the fibrous materials of respirators can survive for an extended period, even after respirator disposal. The mechanical handling of these respirators has a high probability of transfer of these trapped microorganisms to other media and can pose a risk of secondary infection. Healthcare personnel have to use their hands for most, if not all, routine work from providing treatment and handling related equipment to changing patients' clothes, documenting treatment etc. As a consequence, their hands are at high risk to come into contact with bodily fluids that may contain pathogenic microorganisms. In order to prevent the transfer of liquid-borne microorganisms, since 1890 it has been standard practice for healthcare personnel to wear sterilised medical gloves. In the last few decades, a great deal of improvement has occurred in the production of medical gloves. 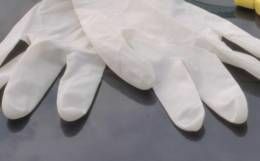 Presently, medical gloves are generally made of different water-repellent textile polymers (typically made of latex, nitrile rubber, vinyl, or neoprene) which can protect healthcare personnel from direct contact with contaminated liquids. In general, these gloves can be classified into exam gloves and surgical gloves. Exam gloves are usually lubricated with cornstarch to make them easy to put on and comfortable to wear. Surgical gloves, however, are not lubricated, as cornstarch may be absorbed by patients during surgery tissues and impede their healing. While this is an important consideration, surgical gloves should be more precise with regards to the fit and/or size of the wearer to provide the utmost protection to healthcare personnel and patients. Along with the hands, other body parts of healthcare personnel may also come into contact with contaminated liquids. In order to prevent the transfer of pathogens, the use of medical gowns by healthcare personnel has been in practice since the early 19th century. These gowns usually consist of a long piece of cloth, fastened at the back with twill tape ties. 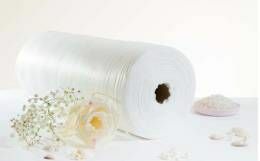 Traditionally, medical gowns are white, representing purity and goodness. However, surgery gowns are often green or blue, which can help to refresh the doctors' vision during surgery. 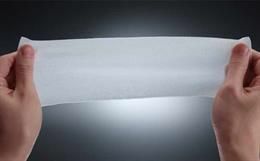 Disposable medical gowns are made of paper and/or thin plastic, and reusable medical gowns are generally made of natural (e.g., cotton) and/or synthetic (e.g., polyester) fibres. The fibres are converted into yarn through a spinning process, and then woven into fabric. Finally the fabric is converted into medical gowns. It is a primary requirement that the fabric for medical gowns should be waterproof and breathable (water vapour permeable) in order to provide better protection and comfort for healthcare personnel. A waterproof, breathable fabric can be engineered by using: (1) tightly woven (half-basket, plain, or twill weave) fabrics with a water-repellent (silicone or fluorochemical) finish; (2) microporous (pore size <2-3µm) membranes or coatings (polyurethane, polytetrafluoroethylene, acrylics, or polyamino-acid) on cotton nonwoven fabrics; (3) hydrophilic membranes or coatings (such as polyurethane-based thermoplastic elastomer); and (4) smart or intelligent polymers (shape memory polyurethane, or cotton fabric coated with N-tert-butylacrylamide-ran-acrylamide). Along with these functionality requirements, it is also necessary that the fabric used in medical gowns should not promote the growth of any trapped infectious microorganisms; this specification can prevent the risk of secondary infections to healthcare personnel when reusing the gowns. To this purpose, antimicrobial finishes (e.g., silver/metal compound finish, quaternary ammonium compounds finish, N-halamines finish) are often applied to fabrics used to produce reusable medical gowns. In summary, there are various techniques to produce waterproof, breathable, and antimicrobial fabrics for medical gowns. In selecting a particular technique, it is important to consider (1) the physical and chemical properties of the needed fabric, including thickness, pore size, and water repellence; (2) the shape, size, and other characteristics of pathogenic microorganisms, such as their morphology, motility, and adaptation to environmental temperatures; (3) the key characteristics (surface tension, volume, and viscosity) of the liquid carriers of the microorganisms; and (4) the external factors that make up the environment of healthcare personnel, the most pertinent of which are physical, chemical, and thermal stress. Health organisations and administrators should prioritise educating healthcare personnel about the importance of respiratory and dermal protective equipment in sensitive work situations or environments. Personnel should also be properly trained regarding the donning and doffing of respiratory and dermal protective equipment while on duty. There is a growing need to develop new respirators and gowns that provide effective protection from newly originated infectious diseases such as Ebola and other pathogens. There is also a need to technically redesign and rate the size and fit of respirators and gowns by taking face structure, anthropometry, and wearers' comfort into greater consideration. Finally, newly developed respirator and gown materials should not generate any kind of secondary infection risk. It is expected that newly developed high-performing respirators and gowns should provide better protection and comfort for healthcare personnel. 1. Goldfrank, L. R., & Liverman, C. T. (2007). Preparing for an influenza pandemic: personal protective equipment for healthcare workers. The National Academic Press, USA. 4. Zhong, W. (2013). An introduction to healthcare and medical textiles. DEStech Publications Inc., USA. 5. Johnson, D. F., Druce, J. D., Birch, C., & Grayson, M. L. (2009). A quantitative assessment of the efficacy of surgical and N95 masks to filter influenza virus in patients with acute influenza infection. Clinical Infectious Diseases, 49(2), 275-281. 6. Derrick, J. L., & Gomersall, C. D. (2005). Protecting healthcare staff from severe acute respiratory syndrome: filtration capacity of multiple surgical masks. The Journal of Hospital Infection, 59(4), 365-372. 7. Belkin, N. L. (1997). The evolution of the surgical mask: filtering efficiency versus effectiveness. Infection Control and Hospital Epidemiology, 18(1), 49-57. 8. Madsen, P. O., & Madsen, R. E. (1967). A study of disposable surgical masks. American Journal of Surgery, 114(3), 431-435. 9. Chen, C. C., & Willeke, K. (1992). Aerosol penetration through surgical masks. American Journal of Infection Control, 20(4), 177-184. 10. Vanturnhout, J. V., Adamse, J. W. C., & Hoeneveld, W. J. (1980). Electret filters for high-efficiency air cleaning Electret filters for high-efficiency air cleaning Electret filters for high-efficiency air cleaning Electret filter for high efficiency cleaning. Journal of Electrostatics, 8(4), 369-379. 11. Moyer, E. S., & Bergman, M. S. (2000). Electrostatic filter media efficiency degradation resulting from intermittent sodium chloride aerosol exposure. Applied Occupational and Environmental Hygiene, 15(8), 600-608. 14. Osborne, M. P. (2007). William Stewart Halsted: his life and contributions to surgery. The Lancet Oncology, 8(3), 256-265. 16. Mukhopadhyay, A., & Midha, V. K. (2008). A review on designing the waterproof breathable fabrics part I: fundamental principles and designing aspects of breathable fabrics. Journal of Industrial Textiles, 37(3), 225-262. 17. Mukhopadhyay, A., & Midha, V. K. (2008). A review on designing the waterproof breathable fabrics part II: construction and suitability of breathable fabrics for different uses. Journal of Industrial Textiles, 38(1), 17-41. Sumit Mandal is with Department of Human Ecology, University of Alberta, Canada and Guowen Song is with Department of Apparel, Events, and Hospitality Management (AESHM), Iowa State University, USA.